I know people that do not sew anything on Motzei Shabbos. What is the source for this Minhag? The minhag of refraining from sewing on motzei shabbas goes under the umbrella of women not doing melachos gedolos (defined by poskim). 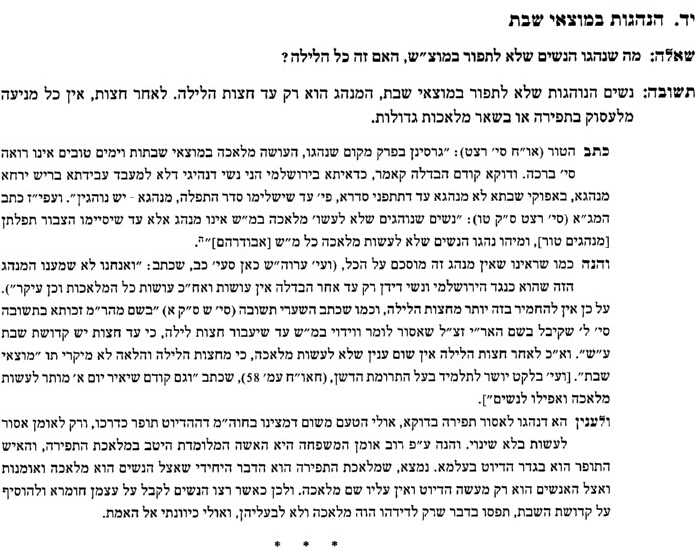 Rav Belsky in Shulchan HaLevi explains why sewing is singled out as the common custom.He explains that a woman knows how to sew in a proper (uman) fashion ,opposed to a man who sews like a hedyot (not an expert). Do they took on the custom to refrain of doing a maaseh uman,but only up until chatzos. 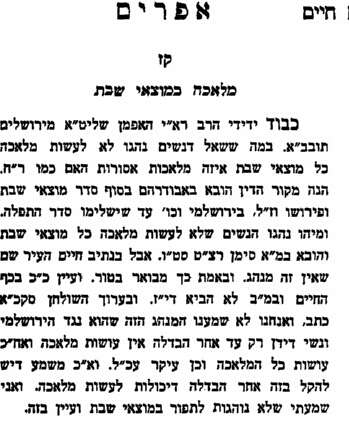 The Rivevos Ephraim 2:115:107 brings down many sources(Aruch Hashulchan says we go with the Yerushalmi which says its not a minhag,rather after havdalah melacha can be done) but ends off saying that sewing is the one melecha he knows ppl are machmir on as opposed to other meleachos. A source that I am aware of is the Mogen Avraham 299:15 who mentions in the name of the Avudraham that woman have a Minhag to refrain from doing work on Motzai Shabbos. Not the answer you're looking for? Browse other questions tagged minhag motzei-shabbos . Should one avoid doing laundry on Motzei Shabbos? Why don't some people say Vihi Noam Motzei Shabbos of Shabbos Hagadol 5772?